Dogs appear to prefer reggae and soft rock over other genres of music, according to researchers. 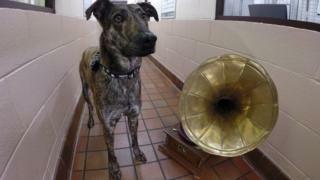 The Scottish SPCA and the University of Glasgow have published a paper which suggests music affects dogs' behaviour. Researchers played a variety of music to dogs at a rehoming centre in Dumbarton and assessed physiological and behavioural changes. Prof Neil Evans said the most positive behaviour changes were seen when the dogs were played reggae and soft rock. All though these genres stood out, he said the study suggested each dog had its own music tastes. Prof Evans said: "Overall, the response to different genres was mixed highlighting the possibility that like humans, our canine friends have their own individual music preferences." The dogs were played five different genres of music: soft rock, Motown, pop, reggae and classical. The study suggested that dogs spent "significantly more time lying and significantly less time standing" when music was played, regardless of genre. By measuring the dogs' heart rate, researchers said they showed a decrease in stress levels when played music - particularly when it was soft rock or reggae. PhD student Amy Bowman said: "We were keen to explore the effect playing different genres of music had. "It was clear that the physiological and behavioural changes observed were maintained during the trial when the dogs were exposed to a variety of music." The Scottish SPCA said it would now be investing in sound systems for all its kennels. Gilly Mendes Ferreira, of the SSPCA said "At present both our Glasgow and Edinburgh centres are able to pipe music into their kennels. "In the future every centre will be able to offer our four-footed friends a canine-approved playlist, with the view to extending this research to other species in our care." Scotland's animal welfare charity previously released research in 2015 that showed the impact classical music had on a dog's behaviour. A cellist for the National Symphony Orchestra, David Teie, has also studied what sounds cats prefer and composed music they found "soothing".